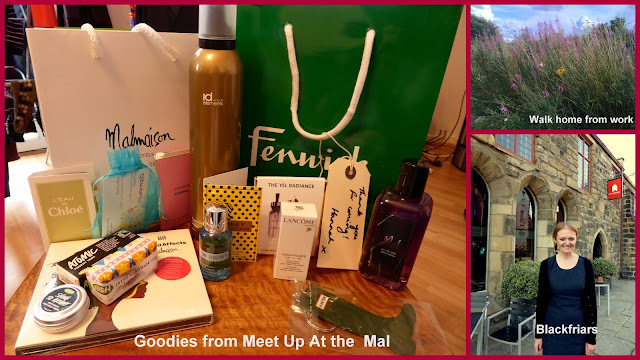 I have a lot to smile about on this lovely Monday morning :) On Saturday I went to my second bloggers event, this time organised by the lovely Hannah at Raspberry Kitsch (a blog I've religiously read since discovering Newcastle) and held in the Malmaison. Despite working very close to the Mal and walking past it every day I hadn't been in for a snoop round so I was very excited that the event was held there. I was stupidly nervous before, to the point where Simon walked down to the Quayside with me just to calm my nerves. But I was brave and made my way up to the 7th floor of the hotel where I spent a really lovely afternoon talking to lots of new people, drinking champagne and eating exploding chocolates. Anyone who has ever relocated knows how difficult it can be to feel settled in a new home, and as much as I love my new city and my new life with my boyfriend it has been very hard leaving behind my friends and family so I am so thankful to the blogging community in the North East who have made the transition a little bit easier for me. It's such a nice feeling to feel a part of something and to spend an afternoon chatting to interesting and passionate people. So huge thanks to Hannah for organising and to all the lovely people that I met who made me feel so welcome. I was also ridiculously lucky and won a prize in the raffle. I had my eye on all of the Mal prizes and had fingers and toes crossed that I would win one and was absolutely delighted to win brunch for two at the Mal, an absolutely perfect prize for me as brunch at the Mal is something that's been on my list of things to do for a while. So excited about a return visit, and am thinking of booking myself in for some pre-holiday treatments at the spa next month too. Next weekend Simon's Mum is visiting us, it will be her first trip to the North East so am looking forward to planning a fun day for her. If anyone has any suggestions please let me know, at the moment I'm thinking Garden Kitchen for lunch and maybe a little jaunt on the tour bus.